All praise due to Allah the Almighty, who honored the human being by the power of knowledge and speech and crowned them as the most eminent creation. Allah bestow His countless mercies and millions of blessings and salutations upon the seal of prophet hood, the messenger of peace and harmony with whose arrival the world was blessed with the divinity of Iman and light of knowledge and recognition. There is no doubt that the Islamic institutions are the strong forts of Islamic culture and tradition and are guardians and protectors of Islam. Now a days when the western culture is practiced everywhere and is favored by everyone, Islamic culture has no place in the society. In these evil-days the Islamic institutions have tried their level best to protect the faith and Islamic doctrine and therefore, they have resorted for the education of Muslim community. These institutions are the one who confronted the mischief and evil deeds of the western culture and impart the knowledge of Islam. As a matter of fact these Islamic institutions are the saviors and representatives of Islam. Western culture and missionaries, especially in India has tried their level best to stop Muslims from their religion and created the atmosphere for the growth of Christianity and Qaiyanism and are being promoted and financed on international level. Under these unfavorable circumstances, the Islamic scholars and philanthropic Muslims have taken the task of spreading the Islamic education through the network of Islamic institutions called "Madrasah" by the virtue of which Alhamdulillah the Muslim community is prevailing and existing with their culture and faith. There were some places where un-lslamic rules and regulations were widespread; there was no Masjid, if there was any Masjid it was not attended by the Muslims of the locality. In such a condition of the society a brave converted Muslim named Muhammad Omar Hussami established a madrasah named "Faizul Qur'an" in the year 1987 at his native place Kishtapur, situated 100 kms from Hyderabad with the help of his trusted friends. Allah had blessed (late) Muhammad Omar Hussami with the everlasting faith of Iman, lead him forth from the depths of darkness of polytheism. Before his conversion to Islam, he was a well respected and renowned personality of his society and a well established merchant of liquor and was famous by the name of "Lakshmaiah" in the village but his heart was deprived of the light of Iman. He tried to fulfill the spiritual vacuum with ideological sources. At last he found satisfaction in Islam, the sacred religion of Almighty Allah. Maulana Muhammad Hameed uddin Aqil Hussami helped him become a true Muslim and named him "Muhammad Omar Hussami". After embracing Islam he turned all his interest in the welfare of Muslim society and to educate his children in Islamic studies and made them all as Hafiz and Alim. Besides he thought of giving education to the children of Muslims for which he established Madrasah "Faizul Qur'an" at Kishtapur, he endowed his house and its adjacent one acre land for the Madrasah and now today with the strong help and assistance of his friends and beloved sons the school is on an area of 10.5 acres land. Today this school is providing an excellent Islamic education. Twenty-four years of service towards education and religion By the grace of Almighty Allah, Madrasah "Faizul Qur'an" has rendered good service for imparting Islamic education and provided Islamic scholars and Huffaz to the society. The village which was not acquainted with the knowledge of Islam is now surrounded by complete Islamic education. In this locality the Muslims were uneducated and were unaware of simple principles of Islam, and were unaware of Namaz, Fasting, Juma and Eid prayers and Qurbani etc. The ignorance prevailed to such an extent that there was no one to lead the Janazah prayer. Alhamdulillah with the help of Islamic scholars and Huffaz provided more than 175 Huffaz and Ulama are graduated from this Madrasah and rendering good and unique services to the nearby villages which are flourishing with the Islamic education in this very short time. These days the Christian and Qadiyani missionaries are striving hard to convert Muslims by providing monetary benefits to them. The above said Madrasah and its organizers are working hard day and night to prevent the Muslims from conversion inspite of financial problem, by giving them the true Islamic education. Under the management of this Madrasah Maulana Mohammad Farooq E Miftahi established an institution for girls by the name of" Jamiat ut Tayyibat lil Banat" Kishtapur, after surveying the villages in its vicinity, 12 years ago, with firm believe in Allah (SWT). By the prosperity of this institution, Alhamdulillah today religious awareness is developing among women of villages and remote areas eradicating the superstitions and false faiths prevailing among them. This Madrasah is providing Nazera, Hifz, Alim and primary courses along with tailoring, embroidery and cooking classes. We request Muslim brothers to extend their co-operation by donations to Madrasah so that this Madrasah may achieve success in its efforts. A separate Madrasah for girls by the name of "Jamiat ut Tayyibat"
Students of the madaris should spend most of their time in reading books during studies and prepare themselves for practical services of this Deen. Surely, the status of library and-study room is like that of spinal cord for the Madrasah. But the Madrasah is deprived of a quality library and study room because of the shortage of resources whereas this section is very precious. It is important that the well-wishers and philanthropic personalities come forward and play a pivotal role in establishing this section so that this Madrasah can increase its efficacy. Hope that the well wishers will take note of this and arrange for that supply of books which is primary. Surely, the status of kitchen is like that of spinal cord for the Madrasah with boarding facility, same with this Madrasah where three times food of approximately 500 boy and girl students prepared daily. Cooking 180 kg rice daily to fulfill this requirement is not less than a challenge for this Madrasah. Nowadays this crucial section is established in a dilapidated and worn out house which was endowed by the founder of Madrasah Late Mohammed Omar Hussami at the time of its establishment. Right now, Madrasah is in dire need of the construction of such kitchen where food for 500 boy and girl students can be prepared along with store room where food and grain can be saved and place to feed the students. Hope that philanthropic people will extend their help and co-operation and participate in this noble cause, so that Madrasah can get rid of this unexplained difficulty. ► To eradicate the un-Islamic customs and traditions from the Muslim society in villages. The Muslims are following many bad customs and traditions in marriages and other functions which is leading to extravagance and Pardah is also neglected by Muslim women which, is against the rules of Islam and teachings of the beloved Prophet (SAWS). The Madrasah is taking much interest to rectify the defect in the Muslim society for which they are holding meetings of men and women every week in the adjoining villages and are trying to educate the people. Alhamdulillah everyone is appreciating the efforts of the administrators. This work is most necessary but it's not being done on the required level due to lack of finances. The Madrasah is having staff quarters where 20 teachers and employees are residing with their families. This staff quarter is having temporary shed which is not suitable for the changing seasons of the year. Madrasah have the urgent need to renovate this staff quarter. Some part of this staff quarter is under construction and for its completion Rs. 4,30,000/- is required. "Making special donations on behalf of the deceased with the aim of Esal-e-sawab, supplying construction materials such as steel, sand, cement, concrete etc. 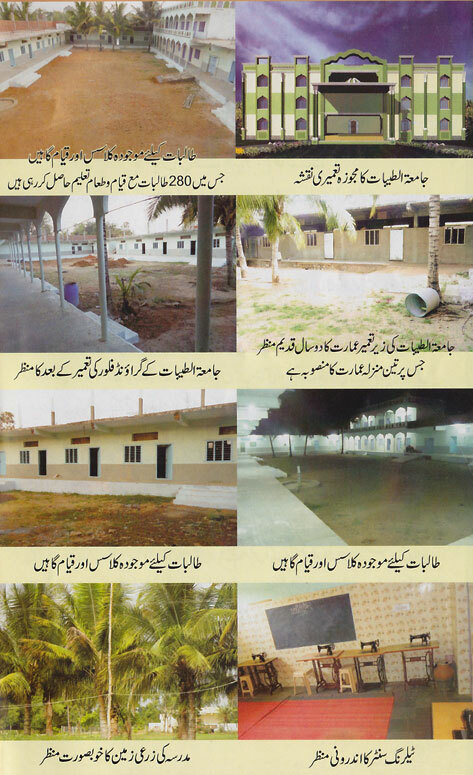 Everyone is invited to visit the Madrasah and verify its functioning. Those people who intend to get the reward of Holy Qur'an memorization and service to the Holy Qur'an; the best and easiest way for them to achieve these two is sponsoring students for Hifz-ul-Qur'an (The Holy Qur'an memorization). Please note that a student requires four years to complete Hifz-ul-Qur'an. H The monthly expenses of a student are Rs. 600 which amount to a total of Rs. 7200 per annum. This amount can be donated at once or in monthly installments. Sources of income: There is no permanent source of income to the Madrasah. With the grace of Allah and the valuable grants and donations by generous Muslim brothers and sisters the school is continuing its journey. At the time of Eld-ul-Azha the Madrasah organizes Qurbani of animals. The animals are purchased and slaughtered in the villages around the Madrasah and for the people who wish to distribute Qurbani meat to the poor it is a better scheme. The meat of slaughtered animals is distributed in nearby villages. The people like to avail the facility may contact the Madrasah few days earlier, so that the Madrasah gets ample time to purchase the animals on their behalf. 3. Zakath, Sadqat, Atyaat,Ration etc. A/c No. 1178101005361, Canara Bank, Rajendra Nagar Branch, R. R. Dist. All praise due to Allah the Almighty, who honored the human being by the power of knowledge and speech and crowned them as the most eminent creation. Allah bestow His countless mercies and millions of blessings and salutations upon the seal of prophet hood, the messenger of peace and harmony with whose arrival the world was blessed with the divinity of lman 3 and light of knowledge and recognition. Education is the fundamental and back bone of a community. On this very basis, Islam has laid emphasis on education from day one. During the reign of prophet (SAW) and sahabah (His followers) several permanent circles of learning and teaching were formed, formal and suitable arrangements were made for the education of women along with men. Unfortunately, the same importance was not given to the education of women in the subsequent ages which they deserved. Consequently, they were deprived of the education so much that they became unaware of the basic and important religious matters. Due to this unawareness, they indulged in various unreligious rituals, traditions, innovations and evil deeds which eventually lead to immodesty and irreligiousness in the household atmosphere. Due to distance from religious teachings and unison with non-muslims, inter communal marriages have become easier. These days little awareness regarding the education of women has aroused but it is restricted only to urban areas, otherwise the literacy situation of villages and 3 remote areas is so worse that even its imagination leaves jittered. 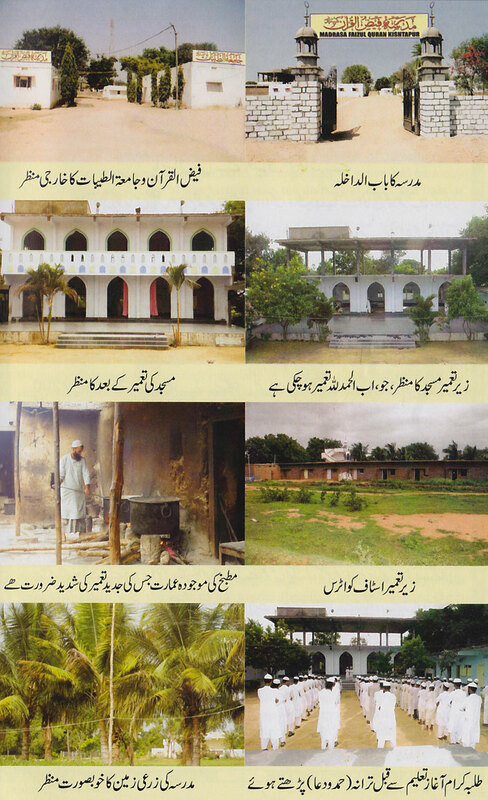 After bringing this worry and need into consideration, the administrators of Madrasah Faiz ul Qur'an" Kishtapur, especially its chairman His Excellency Maulana Mohammad Farooq Miftahi established an institution for girls'by the name of" Jamiat ut Tayyibat lil Banat" Kishtapur, after surveying the villages in its vicinity, nine years ago, with firm believe in _ 3 Allah (SWT). By the prosperity of this institution, Alhamdulillah today B J religious awareness is developing among women of villages and remote areas g 2 eradicating the superstitions and false faiths prevailing among them. E Otherwise, situation was such that they were easily being trapped by the Christian and Qadiyani missionaries as women were their main focus. Under these circumstances, Jamiat ut Tayyibat lil Banat confronted the mischief of these missionaries and created awareness among women in this regard. (1) 40 DAYS: This program is designed for the aged mothers and old women who have very less time because of their responsibilities. So, they can learn Islamic basics such as Namaz and other prayers in short time. (2) 4 MONTHS: This program is designed for young girls soon to get married who cannot give much time. Arrangement of their education and training has been done according to their standard and requirements. (3) 4 YEARS: This program is designed for the girls who have ample time. Alhamdulillah, in Jamiat ut Tayyibat lil Banat reasonable arrangement has been made for essential modem education together with Hifz, Nazirah and Alimiyat courses. At the end of every academic year a great convocation is organized. A large number of women from neighboring localities attend this convocation to encourage the students and return with their hearts filled with worries about Islam and good deeds. Jamia has boarding facility for the education and training of the girl students according to the Islamic guidelines and regulations, where 280 students are residing with full facilities of food and accommodation. Masha Allah, Jamia has arrangement of first-aid and medical facilities. Special arrangement of moral training. Special arrangement for training of tailoring, embroidery and cooking. Arrangement of summer religious classes for girl school going students during summer vacations. Publication and propagation of true Islamic tenets and religious teachings. Arrangement for education and training of young girls and old women. Special attention towards eradication of un-Islamic rituals and traditions from the society. Establishment of tailoring centers in villages and remote areas. The Jamia has been worried since day one to extend its branches in the neighboring village for the education and trainiiTg of women. Alhamdulillah, its well-organized and well-honored branch by the name of "Madrasah Kadijatul Kubra lil banat" was established in Pargi where special emphasis has been given to the education, training and religious welfare of women and weekly meetings are held in the various localities of Pargi. Currently 100 students are studying in Madrasah Kadijatul Kubra lil banat. Due to lack of resources this madrasah is currently functioning in a rented house but efforts are on to arrange an own building. We also intend to spread the network of branches in the neighboring villages and also establish tailoring centers which are very essential. We whole-heartedly appeal to the well-wishers and philanthropic brothers and sisters to donate towards this cause. Since Jamiat-ut-Tayyibaat was established after surveying the poor educational and religious conditions of the surrounding villages, Jamia has always strived hard to achieve its goals. Now, the situation is such that Christian missionaries are targeting Muslim women and trapping them in their net by luring them with offers such as loans and establishment of tailoring centers. And they encourage them to become independent and don't be indigent. It is clear that their intentions are something else. These days, this temptation is spreading its wings in the surrounding villages. Under these circumstances our responsibility increases further to provide basic education to Muslim women and also train them in some skill. In this view, Jamiat-ut-Tayyibat intend to open tailoring centers in more villages and localities where women can learn tailoring and embroidery along with basic religious education. For this purpose, supply of sewing machines is much needed and the Jamia has shortage of sewing machines. A facility is ready for the purpose of establishment of a tailoring center in Madrasah Khadijat-ul-Kubra lil Banat, branch of Jamiat-ut-Tayyibat but the functioning of this beneficial section is delayed only because of the shortage of sewing machines. Hope that philanthropic persons and people with concern for Deen will 3 come forward and encourage lis to bring our mothers and sisters out from this f dire situation and help us. Those people who intend to get the reward of Holy Qur'an memorization and service to the Holy Qur'an; the best and easiest way for them to achieve these two is sponsoring students for Hifz-ul-Qur'an (The 3 Holy Qur'an memorization). Please note that a girl student requires four years to complete Hifz-ul-Qur'an. The monthly expenses of a student are Rs. 600 which amount to a total of Rs. 7200 per annum. This amount can be donated at once or in monthly instalments. With the above mentioned details and explanations needs of the Jamia are quite clear. In this regard, we request the well-wishers and philanthropists to support the Jamia open-heartedly through Zakat, Sadaqat, Donations, Fist funds, Food grain, Skins of sacrificed animals and Sadaqat ul Fitr keeping the needs in mind, especially the construction of the building and remember the Jamia in your daily DUA. A/c No. 62068731736, State Bank of Hyderabad, R. R. Dist.